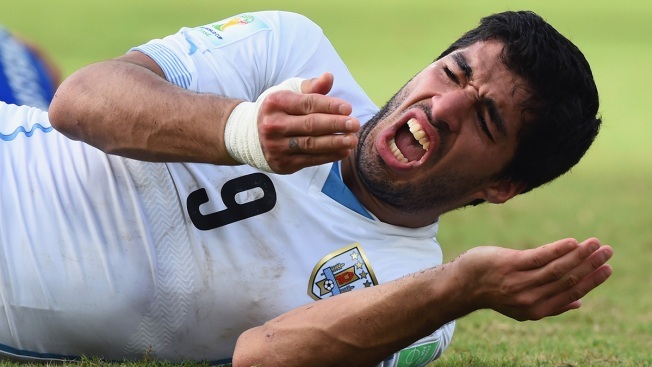 Luis Suarez of Uruguay reacts after sinking his teeth into Giorgio Chiellini during the 2014 FIFA World Cup Brazil Group D match between Italy and Uruguay at Estadio das Dunas on June 24, 2014 in Natal, Brazil. Luis Suarez has issued an apology to Italy defender Giorgio Chiellini for biting him during a World Cup match and vowed never to do it again. The Uruguay striker says in a statement posted on Twitter on Monday that "I deeply regret what occurred," and that "the truth is that my colleague Giorgio Chiellini suffered the physical result of a bite in the collision he suffered with me." Suarez was banned from all football for four months after the incident, which occurred during Uruguay's 1-0 win over Italy in their group-stage game in Brazil. He had denied wrongdoing in a statement to FIFA, saying he simply collided with Chiellini's shoulder. Suarez apologized to Chiellini and "the entire football family," and said "I vow to the public that there will never again be another incident like (this)." On Twitter, Chiellini accepted Suarez's apology.